I can handle virtually any type of move, but my role as an organizer is to handle as much of the planning, timeline and scheduling details as you would like me to. Delegating this will allow you to keep up with your family and work responsibilities. 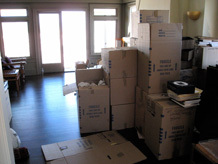 I will provide the least stressful and safest relocation of you and your belongings to your new home. 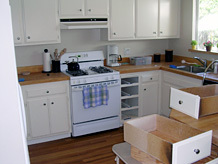 help you purge any items that you won’t need in the new home before getting bids from movers. To this... 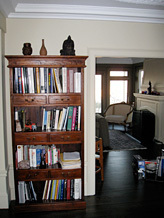 Boxes unloaded, removed and nearly everything in its new home... All in one day. locate cleaners, gardeners, caterers or any other service you need for your new or old home. 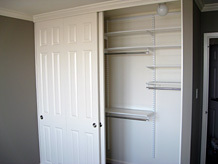 Closet improvements that are designed with your specific wardrobe in mind--- and installed before move day, assure a smooth transition in your new home. Moving provides the opportunity to start fresh. Clean drawers with liners set the foundation for order in your new home. From the sister of a medically disabled woman. “Truly, we could not have made the move without you!! This is to thank you for your thoughtful attention, your kindness, and of course for your skill in getting my sister ’s possessions organized, given away, sold and moved. And she has moved, thanks to you, into a lovely, cozy space that takes every advantage of the room, puts things where they are needed, and leaves a sense of open space - even with the stuff that she has kept for future decisions. We are enormously, tremendously grateful and appreciative."